The Netent slot game Neon Staxx is a game designed in the pop neon style of the 1980s. The graphics and music create a retro-futuristic atmosphere and the background image shows a computer designed area with a grid that reminds a little bit of the movie Tron from 1982. Another interesting point about the game is that the reels are tilted. 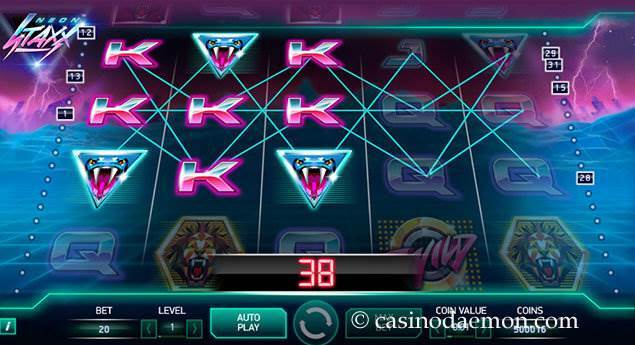 The high-paying symbols show 4 different predatory animals in neon colours and the lower paying symbols show the standard playing card symbols A, K, Q and J. The game also reminds of Twin Spin, as it has a similar feature, which is called Super Staxx. You also have the chance to win up to 20 free spins. The game has a medium to high variance, which greatly affects how you should play it. There will be quite a few game rounds without any winnings, and every now and then you will get a smaller or medium sized win. The game is best played for a long time, and you should try to get an attempt of getting to the free spins. The game is very easy to play, and the features are straightforward, but it is not a game that should be played by players with a lower budget. The average return to player stands as a generous 96.9%. The slot is also available in the Netent Touch selection of slots and can be played on iOS and Android devices. You can play the 80s slot Neon Staxx for free and be taken back in time of the flashy neon lights. The action packed game can also be played for real money at one of the online casinos mentioned on this page. 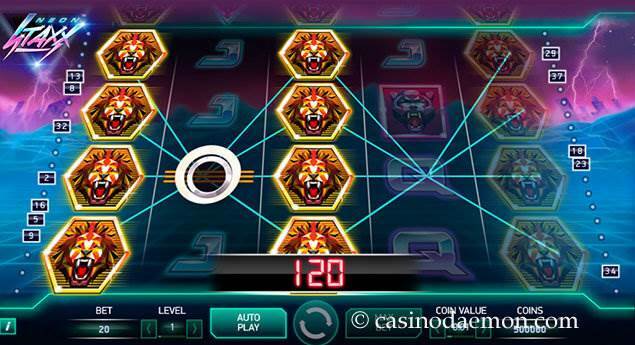 Neon Staxx features a wild symbol that can substitute for all other symbols to complete or create the highest possible winning combinations, but it does not replace the scatter symbol for the free spins. When you manage to get 3, 4 or 5 scatter symbols you can win 10, 15 or 20 free spins. The special feature in the game is the Super Staxx feature, which is essentially a symbol stack covering all four positions on the reel. It can be triggered at the start of a game round and one of the symbols, including the wild, is randomly selected to be the symbol stack. It is possible to get more than one reel with stacked symbols and if you are lucky you can even get all the same symbols on the reels. 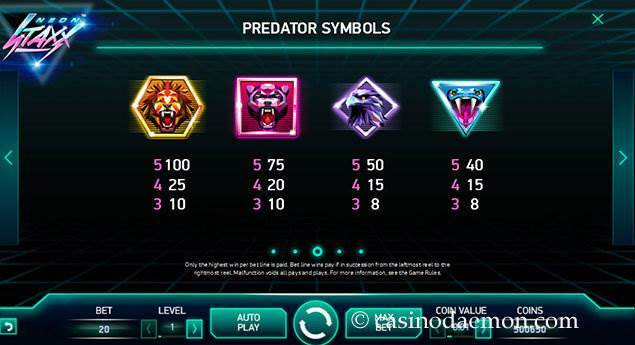 During the free spins the symbol stacks will only be the high paying predator animals symbols. 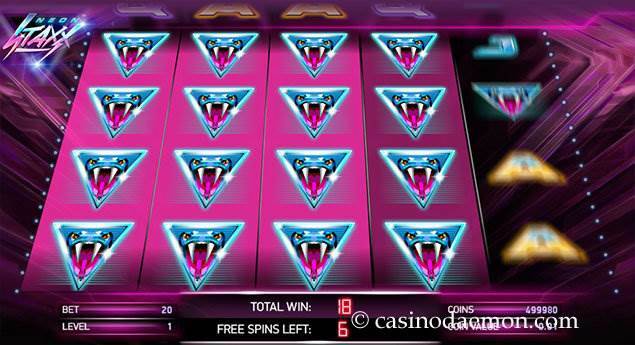 The slot game Neon Staxx from Netent is a 5-reel and 4-row slot with 40 pay-lines. All pay-lines are played with a stake of 20 coins. The coin values range from 0.01 £/$/€ up to 0.50 £/$/€ and it is possible to play between 1 and 10 coins per line. The minimum wager starts at 0.20 £/$/€ and can reach up to 100 £/$/€.